The 2010 Dodge Journey offers minivan conveniences without the minivan stigma and pricing, but it's not refined or capable enough to earn our recommendation. The 2010 Dodge Journey receives driver and front-passenger active head restraints, a larger 9-inch screen for the rear-seat entertainment system and standard keyless entry. Minivan-style interior functionality, perfect crash-test scores, interesting entertainment and communications options, attractive pricing. The 2010 Dodge Journey crossover SUV is effectively a replacement for Chrysler's now defunct short-wheelbase minivans -- a family-friendly vehicle that's a bit more maneuverable than the regular Grand Caravan. The Journey does indeed fill this void in functional terms, offering lots of room for larger families and a number of pleasant convenience and technology features. The question is whether buyers will find its interior quality and driving dynamics sufficient relative to the ever-improving competition. After all, a journey is hardly worth taking if you're not going to enjoy the trip. The Journey's strength is clearly its cabin functionality, where the influence of Chrysler's minivans is unmistakable. Its optional third-row seat sets it apart from two-row crossover SUVs, providing enough room for kids. The Journey is also loaded with clever, well-conceived minivan-style conveniences, from the Flip 'n Stow storage compartment under the front passenger seat to the Chill Zone glovebox beverage cooler. Other neat options include MyGIG, Chrysler's hard-drive-based navigation and entertainment system, and a rear-seat entertainment system with a 9-inch screen. If what you're after is a versatile interior at a reasonable price, the Journey certainly delivers. Speaking of pricing, that's another of the Journey's strengths, as the base SE model costs about the same as a bare-bones five-seat family sedan. How does Dodge do it? Simple: It skimps on interior quality and performance. The Journey's cabin materials are no nicer than those of the dismal Dodge Caliber economy car, on which the Journey is based. As for performance, the base four-cylinder engine is slow and noisy, and the V6-powered SXT and R/T models aren't particularly swift either. Moreover, all Journeys feature ponderous handling and steering that instills little confidence, even by the workaday standards of this segment. Overall, the 2010 Dodge Journey has a split personality. On the one hand, it has interior versatility and technology to spare; on the other hand, it's built like a cheap runabout and performs like one, too. Among competing crossovers, Toyota's RAV4 offers a third-row seat along with better performance, and the surprisingly enjoyable Kia Rondo is another model to consider. The larger, three-row Ford Flex starts at about the same price as a loaded Journey, and is superior in every way. And if you don't need the Journey's optional third row, virtually any two-row crossover SUV on the market will be more pleasant to drive and own. Finally, our consumer reviews show a record of poor reliability in a number of areas. We do not recommend the Journey. A midsize crossover SUV, the 2010 Dodge Journey comes in SE, SXT and R/T trim levels. All models come standard with two-row seating for five; with the optional 50/50-split-folding third-row bench (SXT and R/T only), capacity increases to seven. The base SE comes with 16-inch steel wheels, keyless entry, a tilt-and-telescoping steering wheel, air-conditioning, full power accessories and a six-speaker stereo with a six-disc CD/MP3 changer. The midgrade SXT adds 17-inch alloy wheels, automatic headlamps, heated side mirrors, a trip computer, enhanced interior storage, stain-resistant cloth upholstery, a six-way power driver seat, an auto-dimming rearview mirror, a 115-volt power outlet and satellite radio. The top-drawer R/T features 19-inch alloy wheels, roof rails, remote start, dual-zone automatic climate control, leather upholstery, heated front seats and a leather-wrapped steering wheel with integrated audio controls. Dodge bundles most of the Journey's optional features into packages, and many of the upper trim levels' features are available as options for the lower trims. Other major options, depending on the trim level, include a Chrome Appearance package, sport-tuned suspension and steering, Bluetooth, an iPod adapter, tri-zone climate control, a rear-seat entertainment system and a hard-drive-based navigation and audio system with a back-up camera. The base-model Journey SE comes with a 2.4-liter four-cylinder engine rated at 173 horsepower and 166 pound-feet of torque. It drives the front wheels through a four-speed automatic transmission. Uplevel SXT and R/T trim levels employ a 3.5-liter V6 that produces 235 hp and 232 lb-ft of torque. It's matched to a six-speed automatic transmission with manual shift control. On these trim levels, buyers have a choice of front-wheel drive or all-wheel drive. In our testing, an all-wheel-drive R/T model went from zero to 60 mph in an unremarkable 9.2 seconds -- just as slow as competing four-cylinder models. The EPA gives the four-cylinder Journey ratings of 19 mpg city/25 mpg highway and 21 mpg combined. The front-drive V6 drops to 16/24/19, and adding AWD yields a 15/23/18 rating. None of the above is very good relative to the competition. Every 2010 Journey includes antilock disc brakes, traction control, rollover-sensing stability control, active front head restraints, front-seat side airbags and side curtain airbags for all three rows. A rearview camera is optional, as are handy built-in second-row child booster seats, a first in this segment. In brake testing, a Journey R/T came to a stop in a longish 132 feet. In crash tests, the Journey received perfect ratings in all categories. The government awarded it five starts in both front and side impacts, and the Insurance Institute for Highway Safety gave the Journey its highest "Good" rating for both frontal-offset and side impacts. 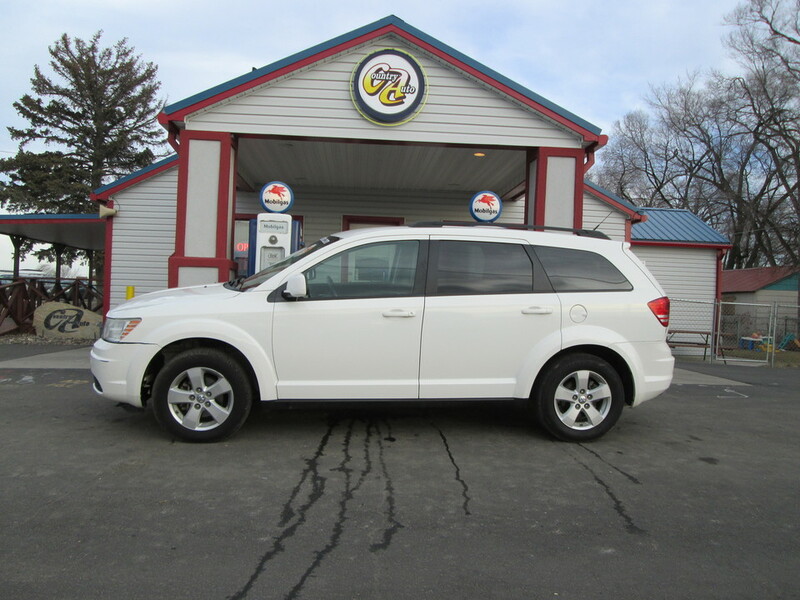 Inside, the 2010 Dodge Journey is a spacious, versatile family hauler. Families with one or two children should find more than enough room in the first two rows, and the optional 50/50-split third-row seat can serve as a sort of emergency backup for kids.The second-row seats slide fore and aft, and access to the third-row seats is a breeze. All-around comfort is reduced somewhat due to the hard and flat seats, however, and the low placement of the audio controls makes them awkward to reach for the driver -- especially with the optional touchscreen-controlled stereo. Materials quality and fit and finish are notably subpar. In terms of utility, there's obvious influence from Chrysler's minivans, as the Journey's interior is awash in cupholders, lidded storage bins and cubbyholes, including tubs beneath the second-row floor and an ingenious compartment beneath the front passenger seat. Maximum cargo capacity is 68 cubic feet, a bit less than what's available in some competing models. Despite its plebeian Caliber roots, the 2010 Dodge Journey is a well-fed specimen, with even the base SE model tipping the scales at a hefty 3,800 pounds. The four-cylinder engine is simply overmatched here -- there's not nearly enough power to merge confidently on the highway, and it sounds as strained as it feels. The V6 in the SXT and R/T models is more appropriate, returning decent acceleration and passing power, but it's still well behind the standard-setting V6 in the RAV4. On the open road, the Journey stays quiet, but its steering is terribly numb and vague. Handling is also poor, even in the ostensibly sporty R/T model. Overall, few crossovers are as unpleasant to drive as this Dodge.